The Base Metal Boom: The Start of a New Bull Market? Base metals are the most fundamental minerals produced for the modern economy, and metals such as copper, zinc, nickel, lead, and aluminum are the key components that support sustained economic growth. During periods of economic expansion, these are the first materials to support a bustling economy, reducing inventory at metal warehouses and eventually their source, mines. Today’s infographic comes to us from Tartisan Nickel and it takes a look at the surging demand for base metals for use in renewable energy and EVs, and whether this could translate into a sustained bull market for base metals. As goes the success and development of nations, so goes the production and consumption of base metals. Development outside of the Western world has been the main driver of the base metal boom, and it will likely continue to push prices higher in the future. China has been the primary consumer of metals due to the country’s rapid economic expansion – and with recent efforts to improve environmental standards, the country is simultaneously eliminating supplies of low quality and environmentally toxic metal production. India and Africa will also be emerging sources of base metal demand for the coming decades. But this is not solely a story of developing nations, as there are some key developments that will include the developed world in the next wave of demand for base metals. 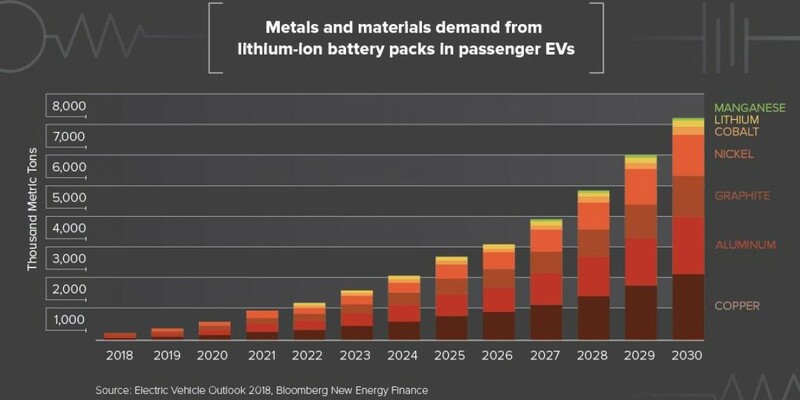 Future demand for base metals will be driven by the onset of a more connected and sustainable world through the adoption of electronic devices and vehicles. This will require a turnover of established infrastructure and the obsolescence of traditional sources of energy, placing pressure on current sources of base metals. The transformation will be global and will test the limits of current mineral supply. The power grids around the world will adapt to include renewable sources such as wind, solar and other technologies. According to the World Energy Outlook (IEA 2017), it is expected that between 2017 to 2040, a total of 160 GW of global power net additions will come from renewables each year. Renewables will capture two-thirds of global investment in power plants to 2040 as they become, for many countries, the cheapest source of new power generation. Renewables rely heavily on base metals for their construction, and would not exist without them. Gasoline cars will be fossils. According to the International Energy Agency, the number of electric vehicles on the road around the world will hit 125 million by 2030. By this time, China will account for 39% of the global EV market. Currently, warehouse levels in the London Metals Exchange are sitting at five-year lows, with tin leading the pack with a decline of 400%. According to the Commodity Markets Outlook (World Bank, April 2018), supply could be curtailed by slower ramp-up of new capacity, tighter environmental constraints, sanctions against commodity producers, and rising costs. If new supply does not come into the market, this could also drive prices for base metals higher. There is only one source to replenish supply and fulfill future demand, and that is with mining. New mines need to be discovered, developed and come online to meet demand. In the meantime, those that invest in the base metals could see scarcity drive prices up as the economy moves towards its electric future on a more populated planet. An extended base metal boom may very well be on the horizon.